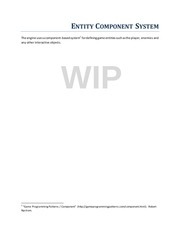 This PDF 1.5 document has been generated by Microsoft® Office PowerPoint® 2007, and has been sent on pdf-archive.com on 16/06/2011 at 04:50, from IP address 124.106.x.x. The current document download page has been viewed 924 times. File size: 1.3 MB (31 pages). were introduced in the first place. modified a lot, but may be extended as needed. contain an instantiation of it. existing object and adds to it. of the photo, as shown in Figure. content forms a new object. have many such new objects.  The original object is unaware of any decorations.  The decorations are independent of each other.  The decorations can be composed together in a mixand-match fashion. can be used wherever IComponent objects are expected. diamond on the Decorator, linked to IComponent. be a photo or an already tagged photo. simple shapes and lines. They too could be tagged. important, even if it does not contain any operations. decorators that make the photo invisible. operation for photos and decorations. will be added behaviors in certain decorators only.  to which it has access. around with them,making them very heavyweight objects. then add behavior keeps the Tag objects lean.  Avoid subclassing because too many classes could result. This file has been shared by a user of PDF Archive. Document ID: 00031439.